Homes are getting smarter, but it takes the right collection of products and services. That's why we put together an entire list for holiday shopping focused on home automation. From speakers to doorbells to light switches and more, we know the perfect items that are game-changers for any house or apartment. Whether you get these as gifts for yourself or a friend, no one will feel anything short of holiday bliss. 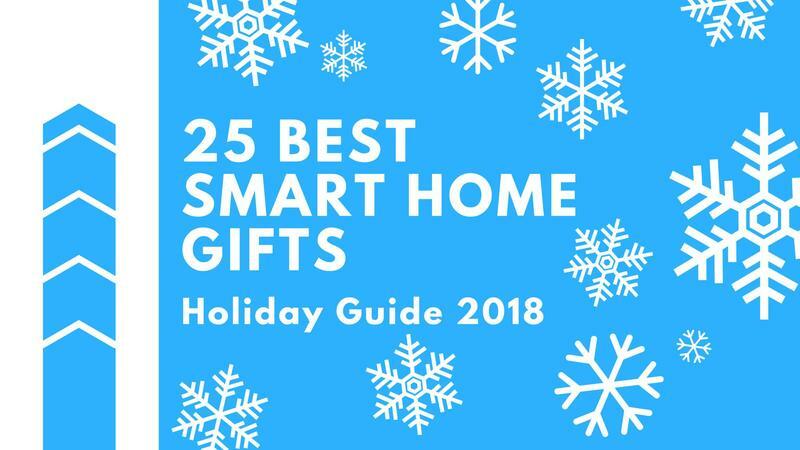 Check out our list of the best smart home gifts to purchase this holiday season. Keys are a hassle, especially if multiple people are sharing a house or an apartment. If someone loses a key or all the locks need to be changed, everyone has to get new keys. Nest and Yale, however, collaborated on a lock that uses a passcode or a mobile device for entry. Just input the code or hit a single button in the Nest app to lock/unlock and be on your way. Amazon upgraded its smart display with a modern design, more powerful speakers, and all the brilliance that Alexa brings along. The Echo Show (2nd generation) can handle video and music streaming, step-by-step recipes, video calls, and more. It also manages all connected devices in any home. Through its Kasa subsidiary, TP-Link sells a power strip that works with both Alexa and Google Assistant. Anything you plug into this power strip can be turned on/off using one of those digital assistants. TP-Link sells a 2-outlet configuration, but we recommend the 6-outlet configuration for total control on various items that are begging to be smartened. Tired of hearing your family or friends complain about an atrocious Wi-Fi network? Get them the Eero Pro Wi-Fi System. It's a collection of three routers that communicate with each other and extend coverage for up to 4,500 square feet. That's enough to cover the living room, kitchen, dining room, and multiple bedrooms. Plus, you'll enjoy the benefits anytime you visit. Forget about getting up to constantly adjust the temperature. With the Ecobee4, you can use a mobile device to control the temperature or talk to a digital assistant. Mind you, the Ecobee4 does have a futuristic appearance with touch-based controls as well. Use the included room sensor (and maybe pick up some more) to automatically adjust the temperature in specific locations. Nest rolled out the Hello, a video doorbell, as its growing effort to automate everything. The Hello uses a high-resolution camera and microphone to let users see and speak with who's at the door. It also has software-side features like 24/7 streaming, facial recognition for familiar faces, motion detection, and prerecorded messages. Get a Wemo Mini Smart Plug, and anything around the home instantly gets connected. The accessory relies on a standalone app or digital assistants like Alexa and Google Assistant for direction. Also, the Wemo Mini Smart Plug allows you to set schedules for when its partnered item needs to be turned on/off during the day or night. Remotes don't need to be so boring. Logitech's Harmony Elite can control just about everything. It's more than a remote for a TV or cable/satellite TV box. And, because of the included hub, Logitech enables its companion app to act as a universal remote as well. Now you don't have to sift through a cluttered drawer of remotes to get the right one. There's no doubt Google Assistant has the deepest knowledge graph around, but you don't have to spend a lot of money for a decent smart speaker that leverages it. The Home Mini leans on Google's digital assistant in a compact design, and it pumps out a premium sound for personal use. You'd be surprised at how well music streaming does on the Home Mini. If the recipient of your gift likes Amazon's ecosystem, look no further than the Echo Dot. It's truly the best all-around smart speaker. Amazon isn't charging a lot of money, and it links with a tremendous number of third-party services. To add some style, choose between a three-color selection and make that special someone so excited to buddy up with Alexa. Either we're too busy or too lazy to vacuum. Why not let someone else do it? Alright, it's not exactly cheap to hire someone for cleaning services. So pick up Eufy's RoboVac 11S as a gift. The robot vacuum scours rooms for dust, debris, and crumbs before returning back to its dock. Most companies with robot vacuums are charging a fortune, but the RoboVac 11S comes in at a cool $219 with free shipping. Ecosystems are plentiful in home automation, and that's why we recommend Samsung's SmartThings Home Monitoring Kit. The central hub acts as a control center for a large number of connected devices, funneling them into just the SmartThings app. Samsung also tosses in a few extras like a motion sensor and a wall outlet. Amazon's Fire TV Cube does a little more than most set-top boxes. It has a microphone to listen for voice commands that Alexa follows through on. Since there are eight of them, Alexa will always pick up on what's being said. The Fire TV Cube also packs a built-in speaker to respond aloud rather than on the TV its connected to. So it's a total game-changer for home entertainment and automation. Nest cares about safety, not just productivity. Give someone a Protect that quietly monitors for smoke and carbon monoxide. Everyone hopes these things are never needed, but it's a piece of technology that ushers in a piece of mind. In one shot, get a complete home security system that's built for tomorrow. SimpliSafe upgraded its line of products to include a base station, keypad, entry sensor, motion sensor, and key fob. That's a solid bundle for $249. If you need additional equipment, SimpliSafe sells larger bundles and then separate items. Whoever receives this gift will get an easy-install for 24/7 safety. Sonos is known for its high-end audio, but the Beam shakes up the sky-high pricing this brand's often associated with. The Beam delivers a crisp and rich listening experience for TV shows, movies, music, and gaming. All the while, Alexa's listening for voice commands. Kudos to Sonos for getting its industry-leading technology into more homes at a better price. The Echo Connect could be one of the best Alexa-enabled devices that no one talks about. It hooks up to a hardwired phone, and then calls are pushed to Echo devices. The same goes for outbound calls. Basically, it extends a traditional phone to anywhere in the home. Sometimes you want the lighting to be just right, and that's tough if you have to get up and move a dial around. Most lights don't even have a dimming effect as an option. By installing the Wemo Smart Dimmer Light Switch, you get a physical meter for dimming but also the ability to adjust the lighting through an app. Of course, it also chats with Alexa and Google Assistant for touch-free control. Amazon scooped up Ring nearly $2 billion, and the reason's obvious. Ring created a low-cost video doorbell that does everything you want. It can monitor doorsteps and send notifications to mobile and Echo devices as necessary. From pretty much any device, you can see, hear, and talk to the person at the door. Need more than what Google Assistant says? People who are into visuals will appreciate the Home Hub. Google's smart display shows detailed information at a glance, and it can serve as a control center for the rest of the connected devices operating around the clock. Philips' Hue line can't be beaten. If your special someone doesn't have any smart bulbs yet, get them hooked with this starter kit. The bundle has four smart bulbs and a hub. Once they have this, they'll start collecting the rest of the smart bulbs for other rooms, outdoor use, decoration, and more. Thermostats don't need to be so expensive. Nest offers the Thermostat E to complete the basics for a tool like this. With its frosted display, you can manually adjust the temperate. However, it's also compatible with iOS and Android devices, as well as digital assistants. While adding some fresh tech to the home, the Nest Thermostat E saves money on energy. Amazon's Echo Spot strikes us as a tiny-yet-mighty alarm clock. It shows the time, weather, and essential information. Need your questions answered? Alexa takes up a residency on this compact smart display, and there's even a front-facing camera for video calls. Google's flagship smart speaker was released in 2016, and it's still one of the most impressive choices. That's because it sounds absolutely amazing for such a simple-looking device. Listen to music, talk to Google Assistant, and control other connected devices. The holidays are underway, and you can probably score one of these for less than $100. Don't miss out, folks. When you're not at home, curiosity strikes and you want to know what's going on. The Cloud Cam from Amazon lets users see into a room at any time. Is there a babysitter watching a child? Has the dog gotten itself into some trouble? Amazon uses a Full HD (1920×1080) lens and night vision for a perfect look, and there's also a microphone-speaker combo for two-way audio.